How to stop the ruler slipping – see caution below! Cut carefully but firmly as before. You should now have two perfect squares (because you had a double layer). Keep these tips by you for the first few sessions, and your rotary cutter will soon be an invaluable friend. 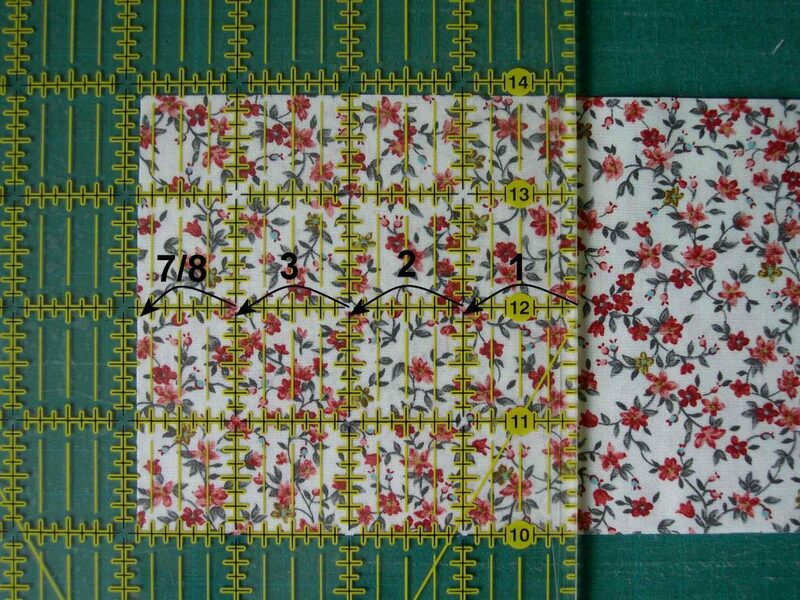 Another page (and a second download) is available, which gives suggestions for slightly more advanced cutting, using other rulers. 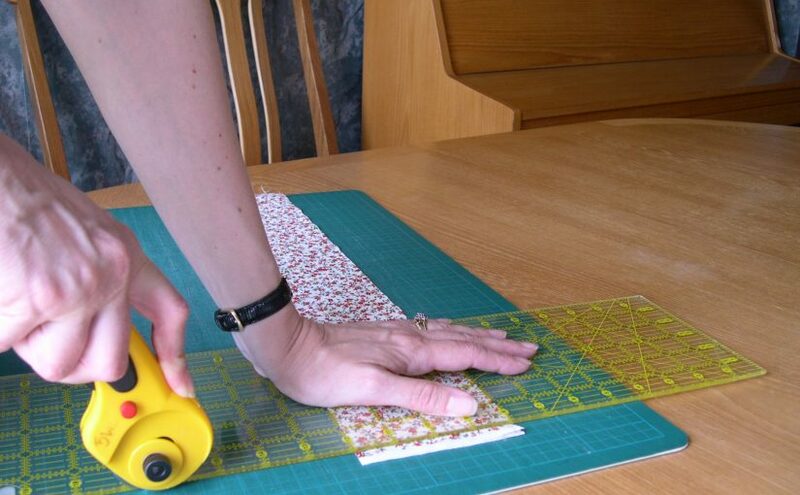 If you are left handed, first of all check that you have adjusted the rotary cutter so that the blade is on the right hand side of the cutter when you hold it in your left hand. Line up the fabric for the initial cut with some space at the left side of the fabric. 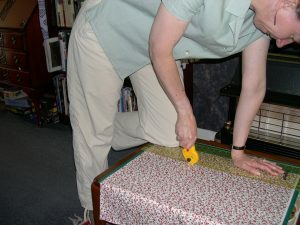 Lay the ruler down over the fabric very close to the left hand edge. 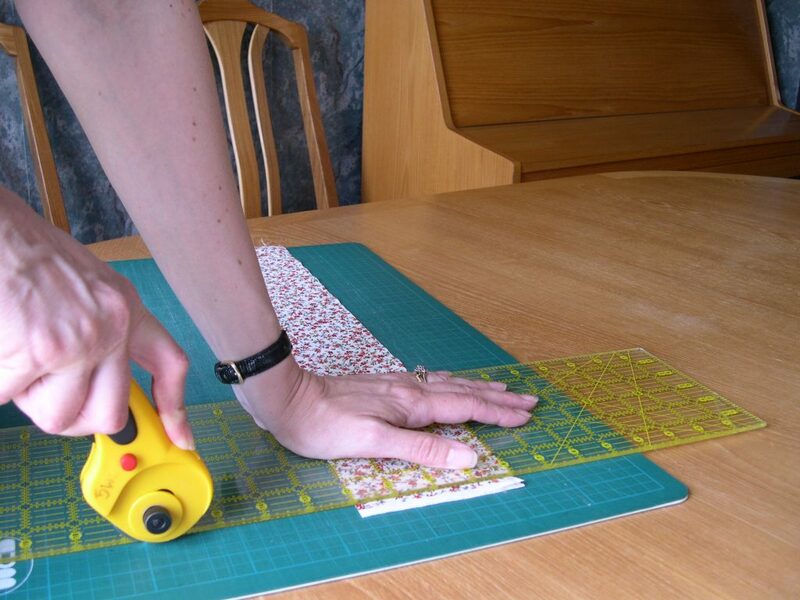 Place your right hand flat on the middle of the ruler to keep it from moving, and, holding the rotary cutter in your left hand, release the blade. Place the blade against the left hand edge of the ruler near to you, about an inch before the fabric begins. Cut along the length. Then move the ruler to the right, until the amount left underneath the ruler is the desired width of strip. Check it is in the correct place by counting in from the left side of the ruler (where you are about to cut) to the freshly cut edge underneath the ruler. Cut the strip. 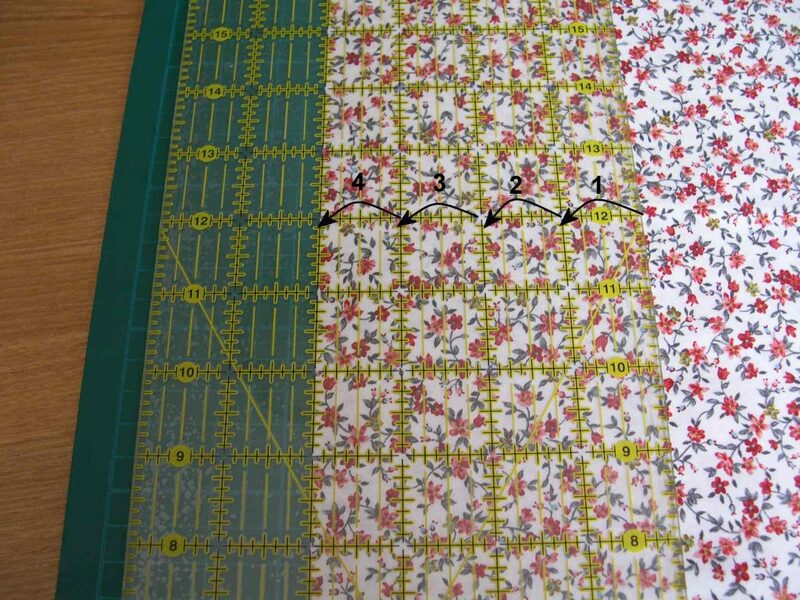 To cut squares, place the folded strip across the board with the selvedges near the left hand edge, and place the ruler over it near this left edge. Cut away the selvedges to leave a fresh cut edge. Turn the board round, and move the ruler to the left, until the amount left underneath the ruler is the desired size of square. Check it is in the correct place by counting in from the left side of the ruler (where you are about to cut) to the freshly cut edge underneath the ruler. Cut the square. The initial outlay on equipment may seem expensive, but don’t be tempted to skimp on size or quality of mats and rulers as these items will last for years. 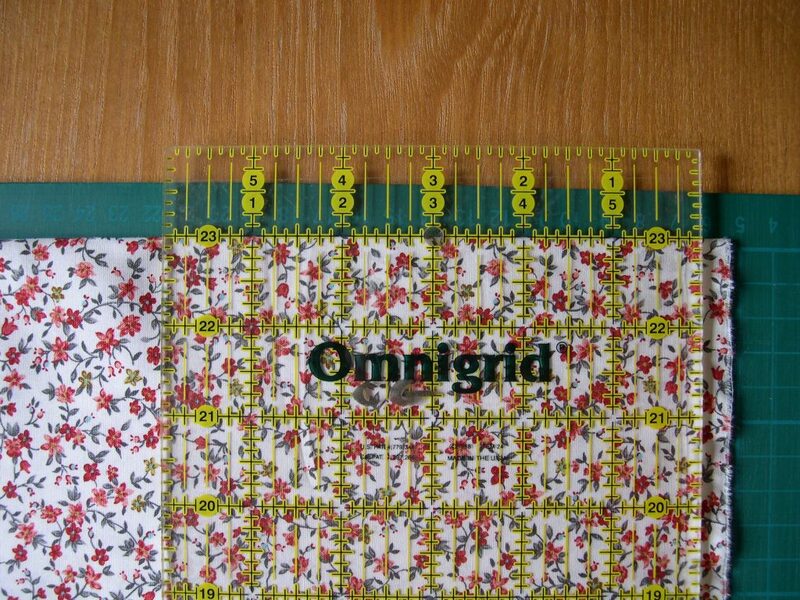 a 6 x 24” Quilter’s ruler. 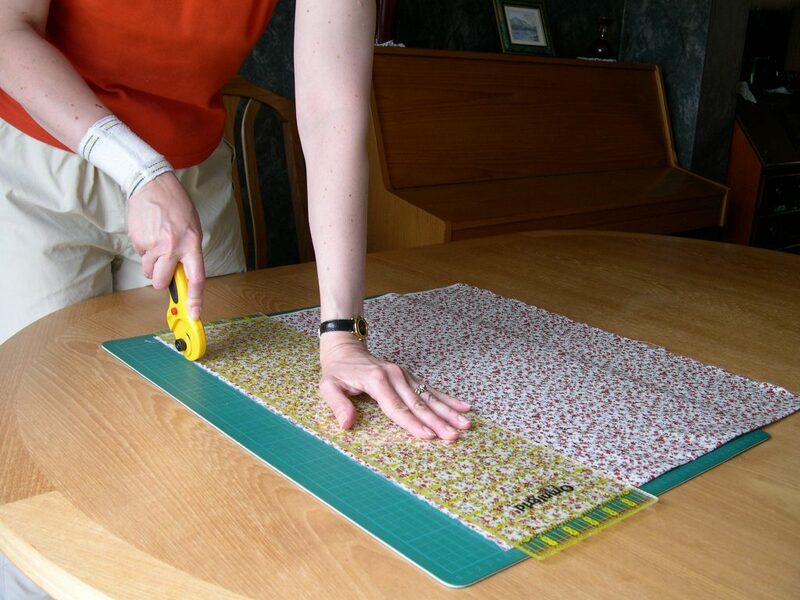 The self healing cutting mat protects your table from damage by the sharp rotary cutter – an A2 mat is big enough to cut the full width of fabric if it is folded once. The method I will show you for measuring does not use the lines on the board unless you are cutting very big pieces. Rotary cutters have very sharp blades, and all have some sort of blade guard to protect you when it is not in use. Try out several types to see how the mechanism operates to release and retract the blade. Some have a squeezy handle, which releases the blade automatically when you pick it up, or a spring loaded blade that comes out only when you press it down on the board. If you are left handed, it is usually possible to turn the cutter over, or to reposition the blade on the other side of the cutter, so that it is always right next to the ruler when you are cutting. When choosing rulers, make sure that you can read the numbers easily, and that the lines can be seen clearly over both dark and light fabrics. 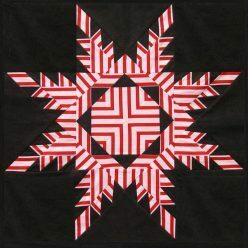 As the Americans (from whom we get a lot of ideas) only use inches, quilters here usually do too, but metric rulers are available if you or your children prefer. Be sure to choose one which has marks every ⅛”, as ⅞” is a commonly required measurement. 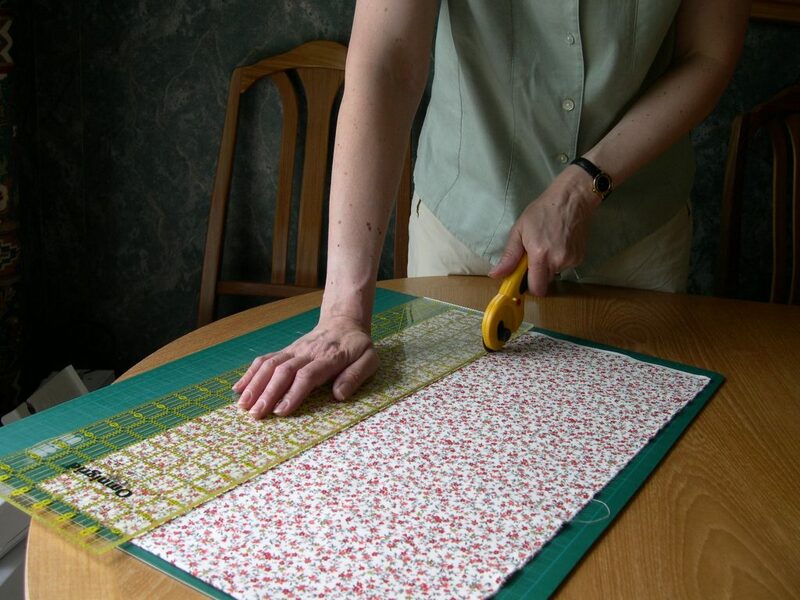 Some rulers have an extra ½” width on one side, which is designed if you intend to cut a lot of simple squares and strips, as these often need to be cut e.g. 4 ½” wide. 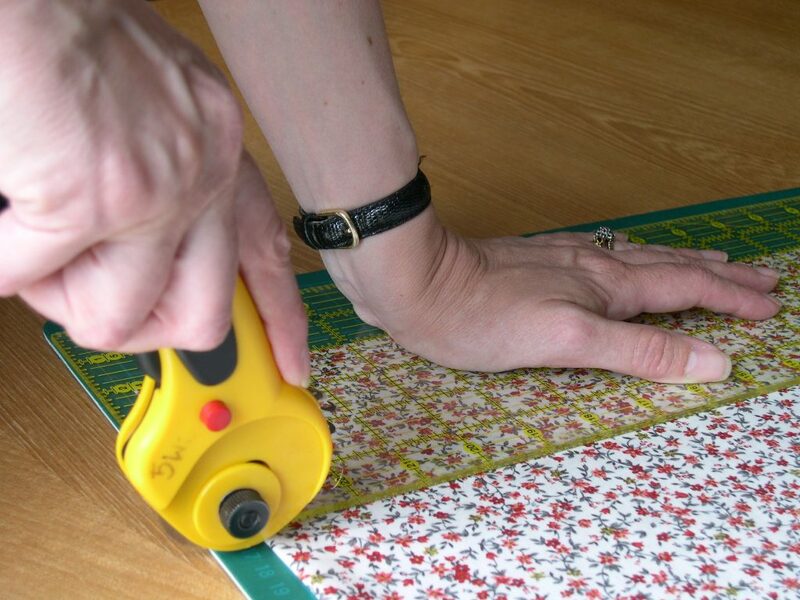 Unless the ruler already has a non-slip surface on the back, you may find it helpful to buy some non-slip “Invisigrip” film or sandpaper stickers to apply. Don’t use anything that raises the height of the ruler, or which obscures important lines. It’s a good idea to label your equipment clearly with your name or a coloured ribbon, so that it doesn’t get muddled up with someone else’s! Beware – the rotary cutter is very sharp, and could cut you (or someone else) badly. Get in the habit of using it carefully from the beginning, and you should be fine. 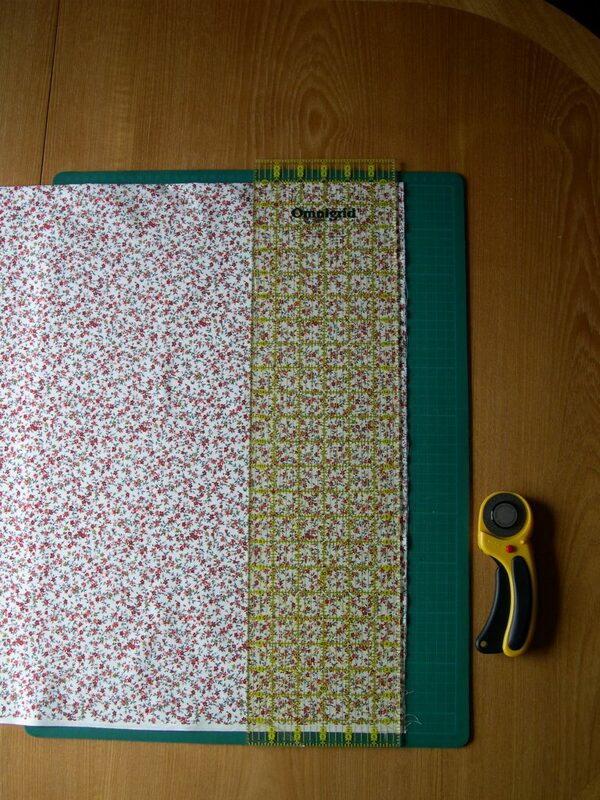 Only release the blade at the instant you need it, after the fabric and ruler have been lined up. Bring the blade in sideways to the flat side edge of the ruler, brushing against the cutting mat, rather than down from above. 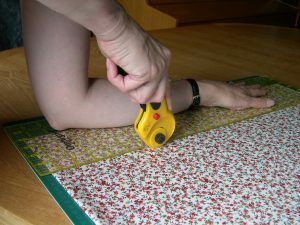 If, by mistake, you run along the top, rather than against the edge of the ruler, the cutter can slide across the surface of the ruler towards your hand or arm, and cause serious damage. 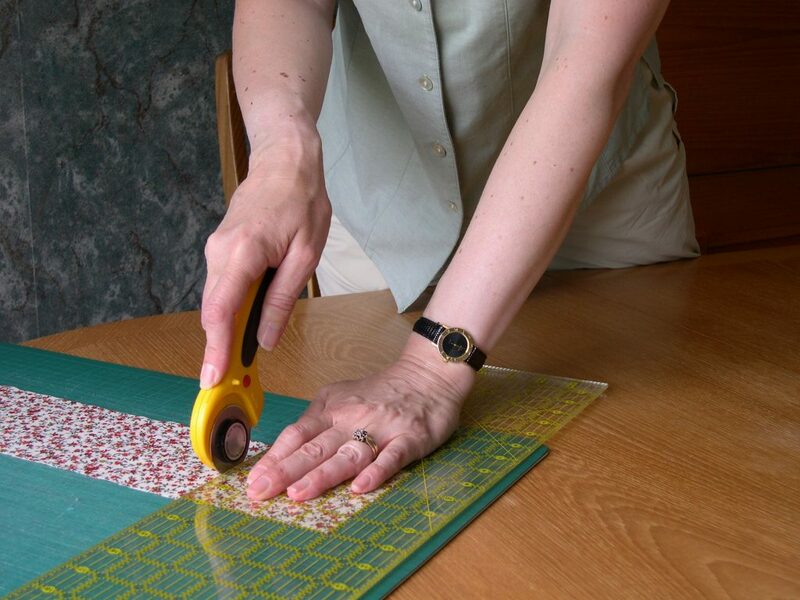 Retract the blade immediately after cutting, before putting it down on the table – you may know that it is still dangerous, but someone else could put their hand on it by accident. Make sure that your thumb is not sticking out over the edge of the ruler. Always cut away from you, not towards the body. 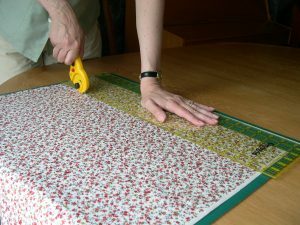 Rest your index finger on the top of the rotary cutter (as you hold a knife), rather than holding the whole handle in your fist – it’s better for your hands, and gives finer control. Blades do get blunt – replace or sharpen when they don’t cut cleanly any more.